Warning! This post contains plot spoilers for Robert A. Heinlein’s novel Citizen of the Galaxy (1957). I recently read the classic science fiction novel Citizen of the Galaxy, by Robert Heinlein. The book is an engaging space-opera tale of a young man who is a slave turned fugitive turned trader turned military recruit turned industrialist. The book is a good read, and it provided a welcome diversion from teaching and dissertation work. As a child and teenager, I would read science fiction to learn about the future. Of course I knew that the future portrayed was imaginary, but I liked partaking of the author’s imaginings of what the future had to bring. Heinlein in Citizen of the Galaxy has plenty to say about the future, as his characters cross the galaxy on faster-than-light starships. Nowadays, though, when I read a sci-fi book, I am more interested in what it can tell me about the past. And that is why I found Citizen of the Galaxy particularly interesting. The next phase of Thorby’s journey is as a member of the free traders, who trade from one end of the galaxy to the other but are not subject to any government. The free traders, like the inhabitants of Jubbul, also have strange customs, but rather than letting them remain mysterious and exotic, Heinlein explains them. Most of the explaining is done by a character who is an anthropologist studying free trader culture on Thorby’s ship. The fictional anthropologist represents the factual period of area studies. After World War II, the United States began to pursue a global foreign policy, and a component of this policy was studying foreign cultures and societies so that Americans could interact with them appropriately. Funding for anthropological research spiked in the early Cold War. The anthropologist’s studying the free trader culture is a logical extension of US government-funded area studies of Asia and Africa from the early Cold War. The last act of Citizen of the Galaxy takes place on Earth, where Thorby struggles to regain the fortune that is his rightful inheritance. It turns out that Thorby’s family controls one of the galaxy’s major starship manufacturers. The industrial operation is capitalistic, and Heinlein uses the fictional company to comment on capitalism in America. The Cold War was a period of a great ideological dispute between capitalism and socialism. The United States promoted capitalism; Heinlein the narrator, true to his nation’s ideology, accepts capitalism. He does not accept it wholesale, though; he highlights its potential pitfalls. As the book ends, Thorby has just regained control of his fortune and is beginning to investigate the family business’s complicity in supplying ships to the slavers. To Heinlein, American capitalism is not value-free, either in the distant future or the 1950s. Capitalists must be held responsible for their actions, both domestically and abroad. 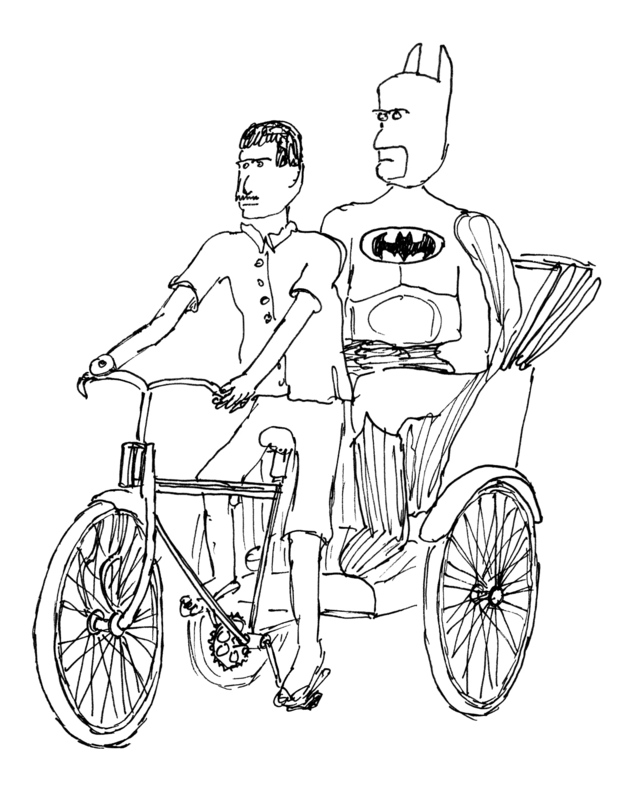 Batman gets a lift after his imprisonment, in a deleted scene from The Dark Knight Rises. About midway through last year’s summer blockbuster The Dark Knight Rises, Batman (the superhero alter-ego of Bruce Wayne) confronts Bane, a demagogue supervillian who has begun to terrorize the populace of Gotham (New York City by another name). Bane and his thugs defeat Batman, strip him of his superhero costume and send him to imprisonment in a far-away land. Up to this point, the storyline and production design of The Dark Knight Rises have been grittily realistic (ignoring, for the moment, some questionable physics). Many of the exterior scenes in the film were shot on location in New York and other American cities. But during the sequence of Batman’s imprisonment, the tone of the movie changes considerably. Bruce Wayne and a band of sullen fellow-inmates are imprisoned in the bottom of a pit. Although the dialogue gives no geographical specifics, the prison seems to be in an exotic and mysterious land. The prisoners’ clothing appears to be coarse homespun cotton or wool, and they attempt to escape from the pit with the help of a thick hemp rope. The prison, wherever it is, seems to be in a place bypassed by the technological changes of the twentieth and twenty-first centuries. I don’t think I will be giving away much of the plot by revealing that Bruce Wayne does not spend the rest of the movie trapped, Joseph-style, in the bottom of a pit. Instead, he heroically ascends the wall of the pit, makes a leap of faith, and climbs out to daylight and freedom. Upon emerging from the pit, he walks in front of a hilltop castle that identifies exactly where he has been imprisoned. 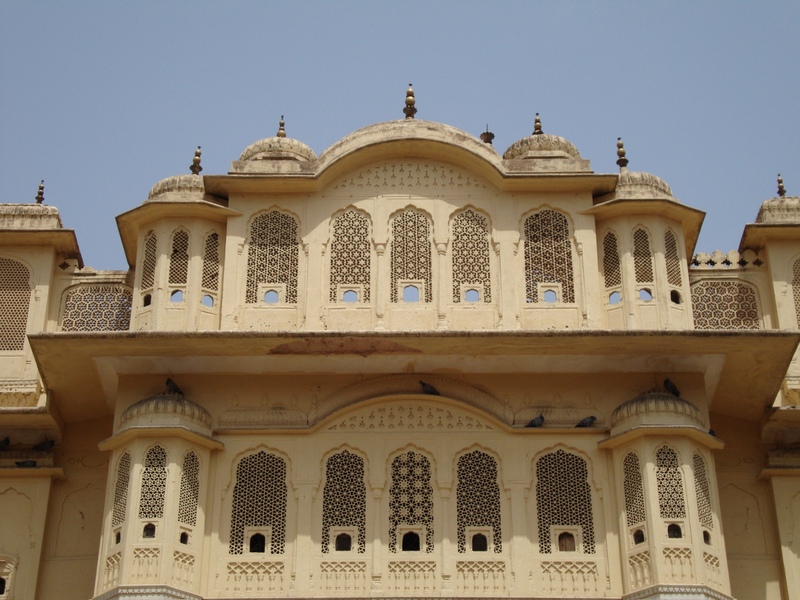 The castle, Meherangarh Fort, is built in the unmistakable Rajput style, which is native to the state of Rajasthan in western India. 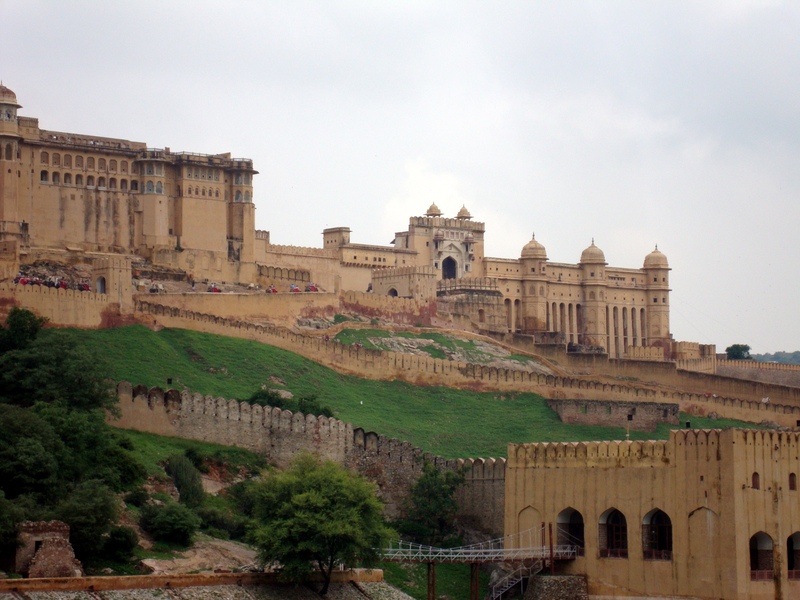 Amber Fort, a Rajput palace outside of Jaipur. 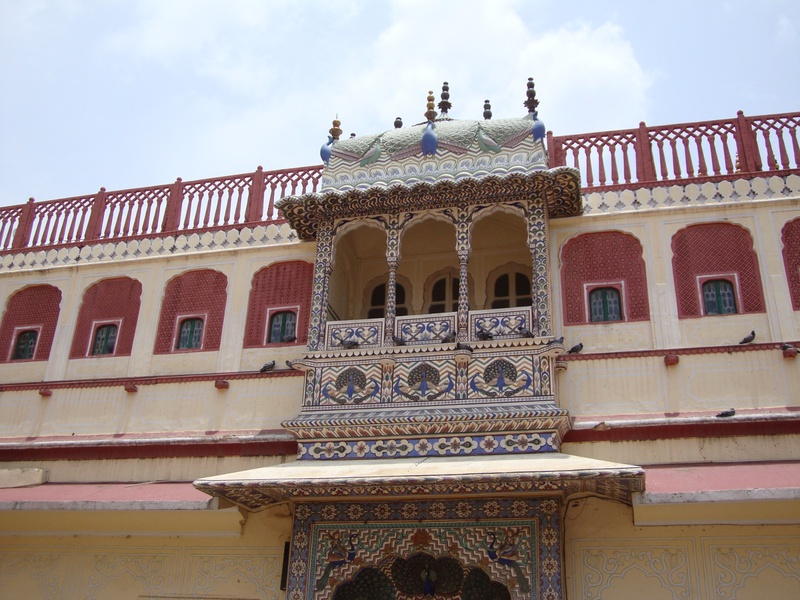 Ramchandra Temple in Jaipur. The spreading roof in the top center of the picture is a motif adopted from the architecture of Bengal. Rich ornamentation in the Peacock Gate of the City Palace in Jaipur. 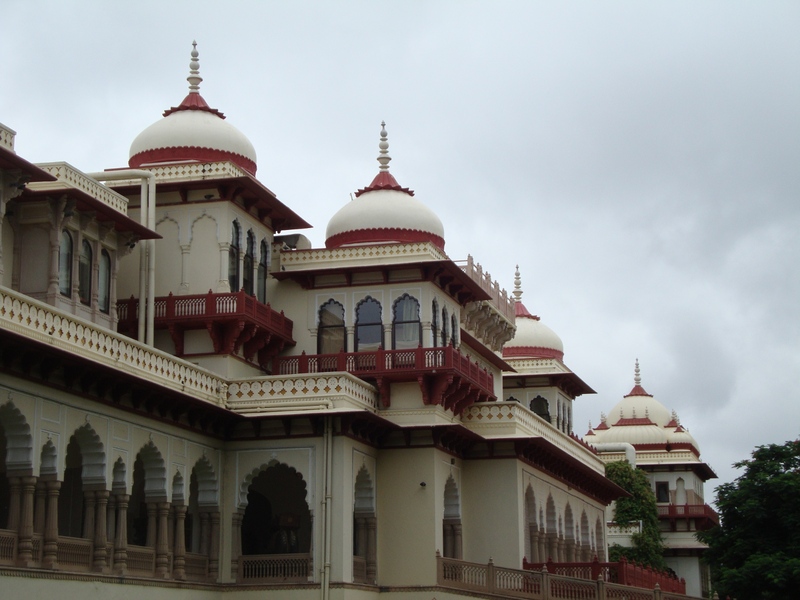 Rambagh Palace, an example of Rajput architecture from the early twentieth century. There may still be places in the world, like Bruce Wayne’s prison, that are untouched by the modern age—places with no synthetic fibers, electricity, concrete, motorable roads, motor vehicles, and Coca-Cola. But Rajasthan is definitely not such a place. 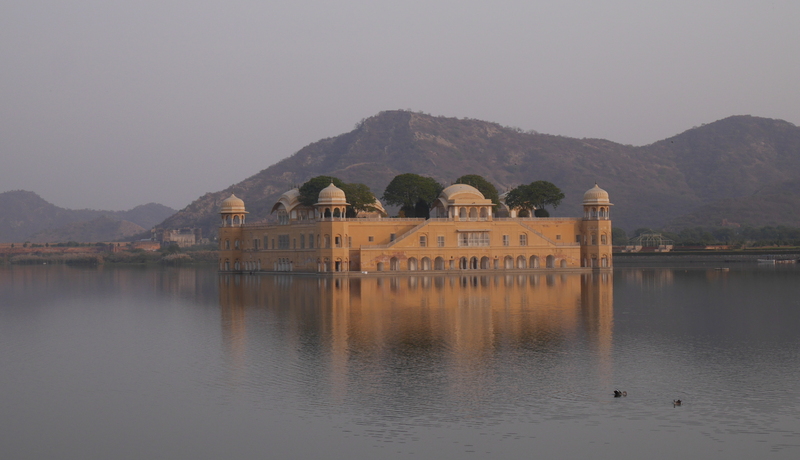 I couldn’t help but think of the contrast between the movie Rajasthan and the real place while watching The Dark Knight Rises. To be precise, I was watching Batman Teen (Batman Three), the Hindi dubbed version; I was watching it in an air-conditioned, digital projection theater in Jaipur, 180 miles away from Jodhpur and Batman’s prison.